Do you like small towns with historical temple ruins and a rich colourful heritage? 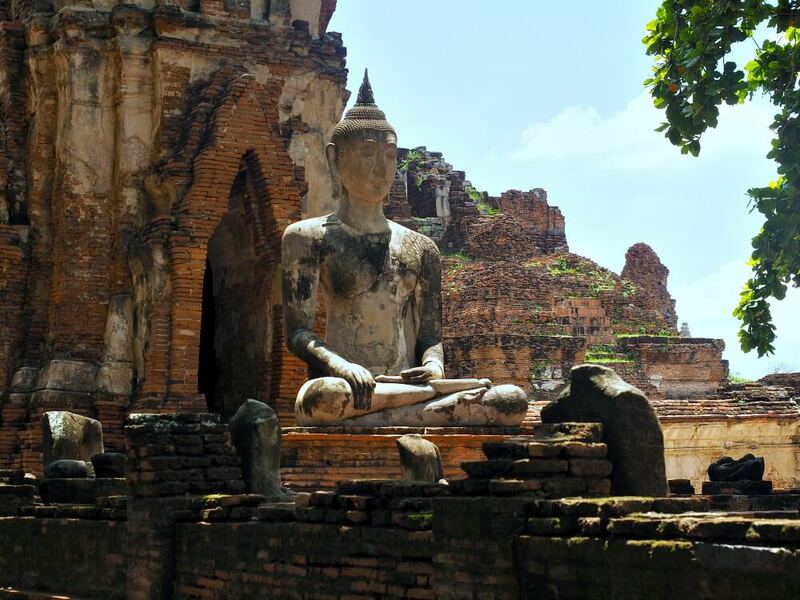 Then a visit to Ayutthaya Thailand, a UNESCO World Heritage Site, will have you spellbound. An Ayutthaya day trip from Bangkok is popular as it’s located just 85 km north of the capital. But there are more things to do in Ayutthaya than visiting the temples at the Ayutthaya Historical Park. And we recommend staying longer when you visit Ayutthaya. 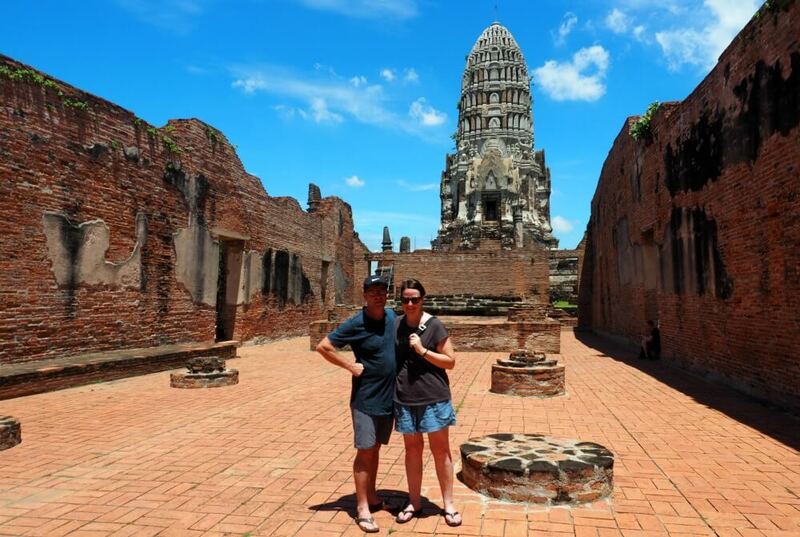 We stayed for two nights and still only managed to see the main Ayutthaya attractions. To be fair, we don’t plan our day with military precision preferring the freedom to linger if we choose. So with a well planned Ayutthaya day trip itinerary, it’s possible to cram more in if you’re pushed for time. But gosh. You’ll be missing out. For information and the latest prices on the best places to stay in Ayutthaya click here. The Ayutthaya kingdom was founded as the capital of Siam in 1350. It flourished as the trade capital of Asia and became one of the world’s grandest cities with a million people calling it home. Sadly it all came to a fiery end in 1767, when the Burmese invaded, plundered their treasures, and set the city on fire. Although the Siamese quickly regained control, the city never recovered its former splendour. And the capital was moved to Thonburi and eventually settled in Bangkok. 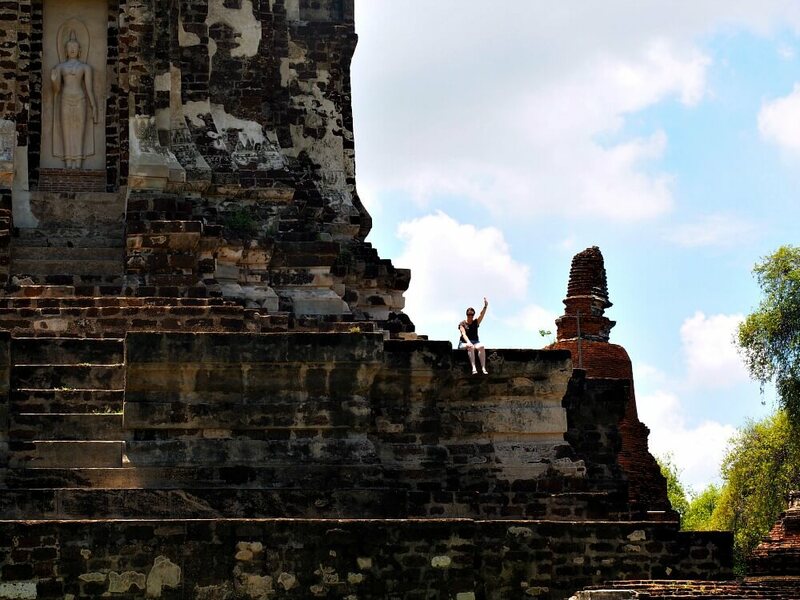 What remains of the once glorious Ayutthaya city are fascinating temple ruins that dazzle wide-eyed tourists. There are 221 historical structures in the ancient city, spread over 289 hectares. And the temples are very different from others we saw around the country. Most visitors spend a few hours on a rushed Ayutthaya tour from Bangkok. But you’ll likely return feeling hot, bothered and frustrated that you couldn’t dive more deeply into the history and culture. Cycling is a popular way to see the temples, and bikes are available to rent all over town. They generally cost 50 baht but we did see them for as low as 40. This isn’t a nice ride in the country though. You’ll be cycling around busy city streets, so take care with the traffic and if you can get hold of one, wear a helmet. You don’t want the hassle of a broken down bike in the middle of the Ayutthaya park. So make sure you check your tires, brakes, bell and gears before riding off. The Ayutthaya weather can be skin-searingly hot! So head out early, carry as much water as you can, and make sure you have money to buy more. Wear sunscreen. I can’t tell you how many people we saw burnt to a crisp. The Ayutthaya ancient city is big. Go slow, take your time and have plenty of rest breaks in the shade. 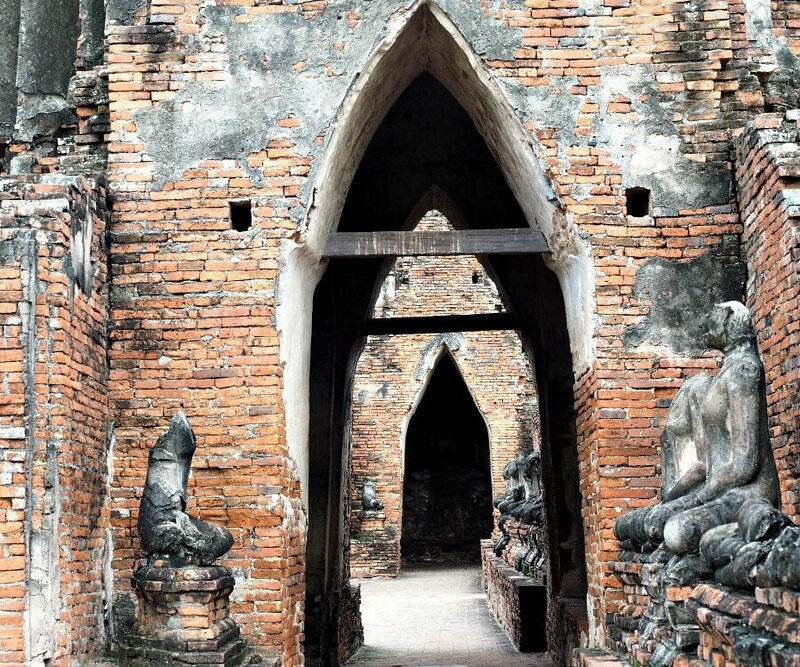 Have an idea of what to see in Ayutthaya and allow time to get from one temple to the next. You can hire a tuk-tuk for the day to drive you around the historical park, and it’s likely you’ll be approached by a driver the moment you hit town. They always charge more than the going rate so haggle a price you can both agree on. And be firm, don’t go and see their cousin’s shop unless you really want to! The same principles apply if you want to hire an Ayutthaya guide for the day. Click here for a list of all the temples and if you’d like an Ayutthaya map click here. Most of the sites are free, but the more famous Ayutthaya ruins cost 50 baht. Here are some temples we recommend visiting. 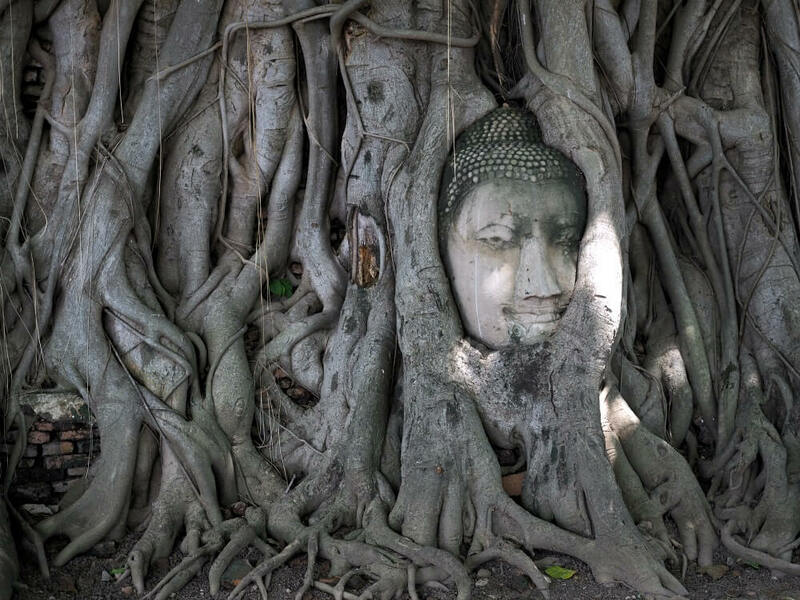 Built in 1374, Wat Mahathat is where you’ll find one of Ayutthaya’s most photographed images – the famous Ayutthaya Buddha head ensnared in a web of tree roots. Several theories abound as to how the head ended up like this. Some people believe it was abandoned by the destroying Burmese army. Yet others say it was left behind by thieves who found it too heavy to carry. 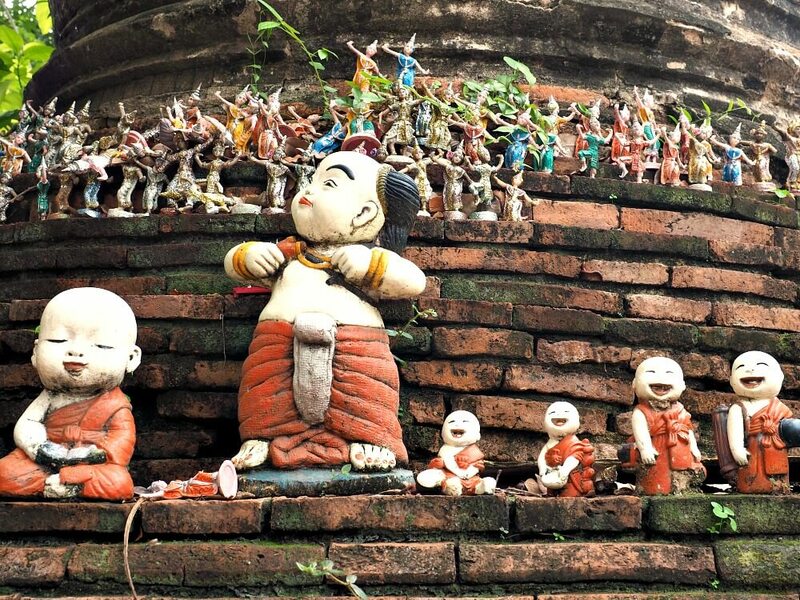 Either way, it’s a bizarre sight and considered to be an Ayutthaya must see. Wat Ratchaburana was built during the early Ayutthaya period, by King Borom Ratchathirat II. It was built at the place where his two brothers died fighting each other for the throne. After their deaths, he was crowned King. We thought this was one of the best temples in Ayutthaya. The tranquil grounds and beautiful trees entice visitors to sit and wonder at the magic of it all. And we spent ages wandering around in the cool shade. Us at Wat Ratchaburana. Love that cameras have timers! We arrived at Ayutthaya from Ao Nang feeling fresh and fired up to start exploring. So we snapped up the chance of an Ayutthaya sunset cruise. We thought the cost was reasonable at 200 baht each for two hours on the river. The tour was in a long tail boat and, with only ten people on board, there was plenty of room. There was a great sense of camaraderie, with people sharing their stories, food, and laughter. And we all helped each other with the tricky exercise of getting on and off the boat. Admittedly, some of us needed more help than others! 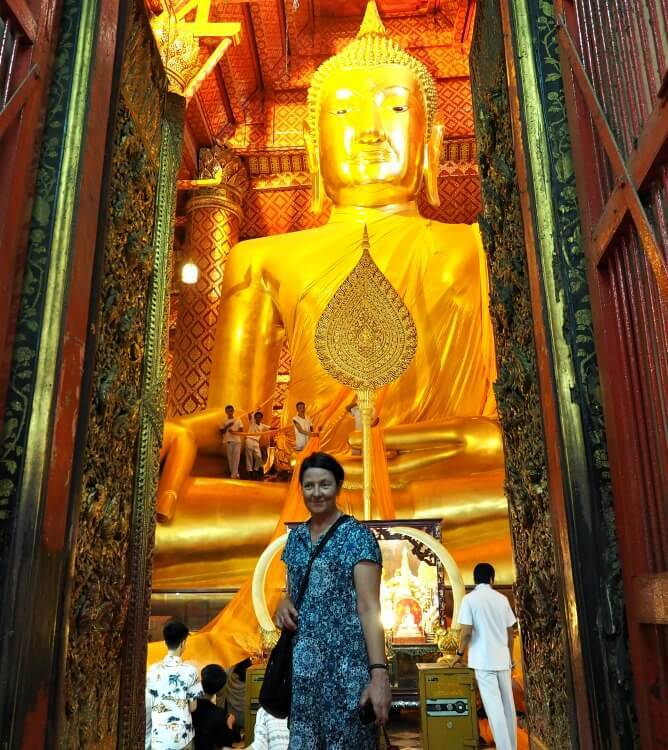 We visited three temples on the tour, Wat Phanan Choeng, Wat Putthai Sawan and Wat Chai Wattanaram. Wat Phanan Choeng was easily the star of the evening with its impressive 19-metre gold Ayutthaya Buddha Statue. This temple has a more modern look and can be busy with people coming to worship. We were surprised by the strong Chinese influence and noticed some quirky characters dotted around the grounds. You can get an idea of size by the people standing in the Buddha’s lap! We were glad we were able to see this temple as it’s difficult to get to without a boat. 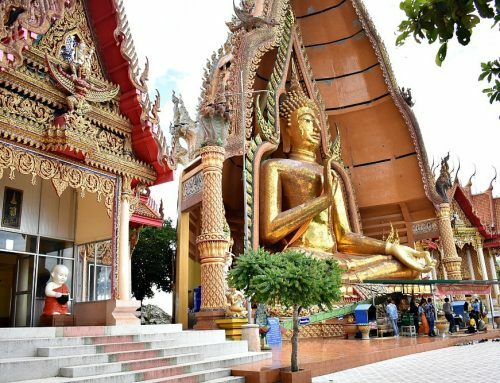 It features a large whitewashed prang and a magnificent reclining Buddha. This is another temple with Chinese influence and it features some cheery little Buddha images around the complex. Wat Chai Wattanaram was built in 1630 by King Prasat Thong to commemorate his mother’s hometown and celebrate his coronation. This was the last temple we visited and it was eerie walking around the silent temple grounds under the darkening sky. Ayutthaya’s markets are a mind-boggling riot of colour and smell. Unlike other markets, they’ve developed naturally over time rather than in response to tourist demand. They’re a slice of real Thai life where you can see local people going about their daily chores. The goods on sale are authentic too, with creepy crawlies that’ll give you the heebie-jeebies. As the oldest market in Ayutthaya, Huo Ro Covered Market has an authentic and vibrant atmosphere. It’s a decent sized market where locals come to shop, eat and catch up with friends. 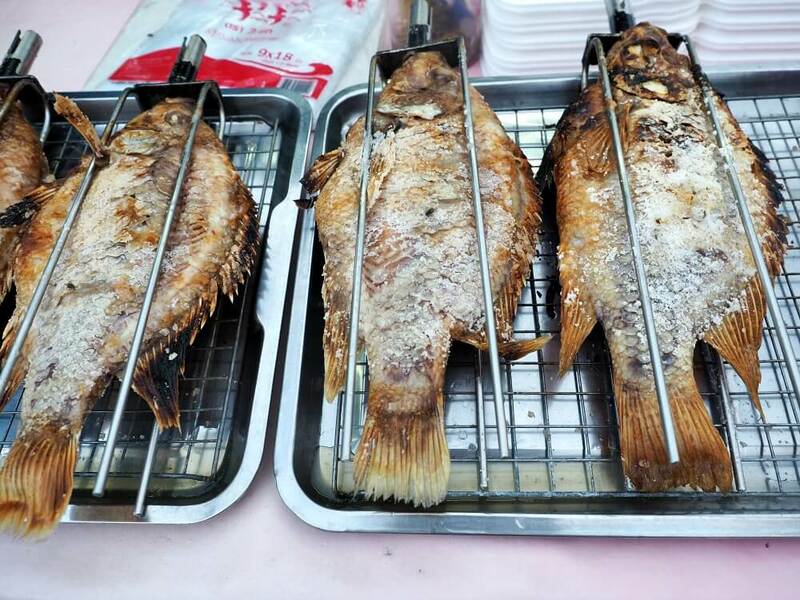 This market is located on the Pasak river just 300 metres from the Hua Ro Market. It’s mostly a food market with tables set up along the river. We were dropped off here after our boat tour and we were hoping to have dinner, but with the bad weather, we opted for takeaway instead. It was still delicious though! 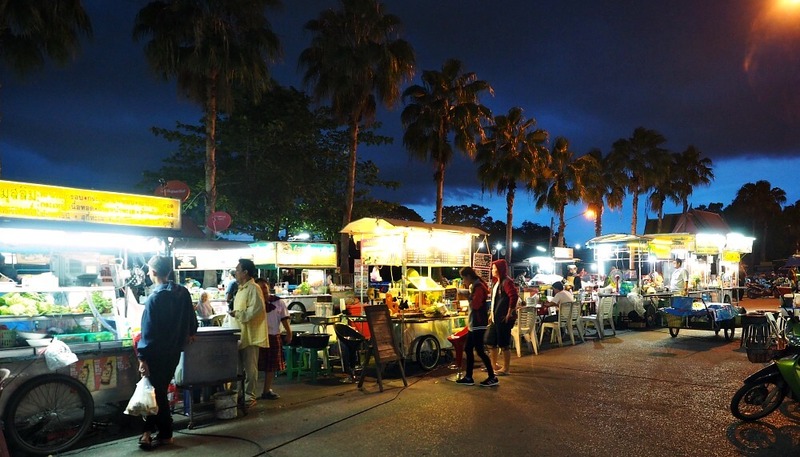 This fabulous night market is the largest in Ayuttaya and has all kinds of food on offer. You can have grilled fish, marinated chicken, noodles and of course curry and rice. And, yes. There were bugs! 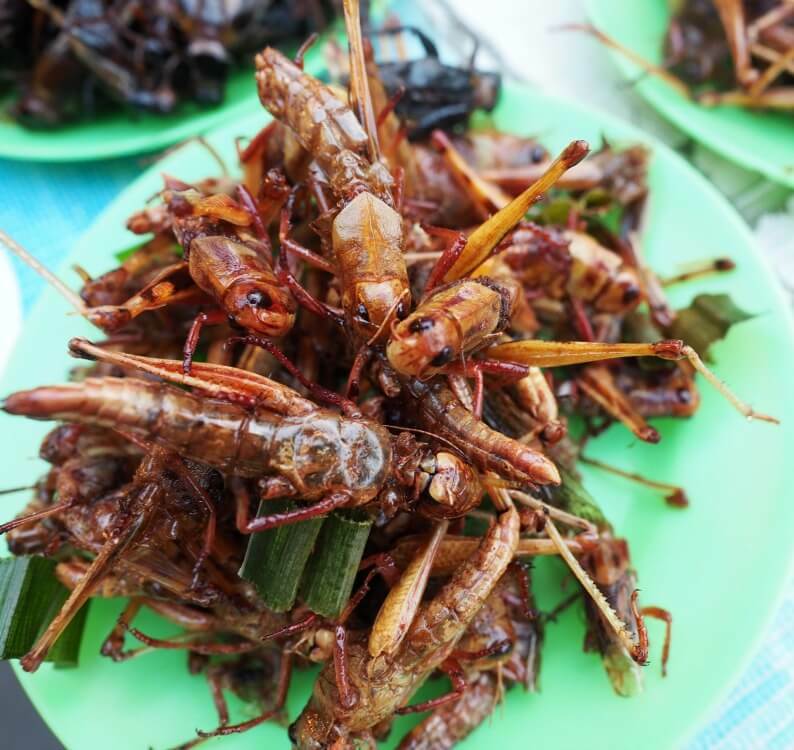 Not so yummy fried crickets! We recommend at least an overnight stay (but 2 nights is better) in an Ayutthaya hotel. 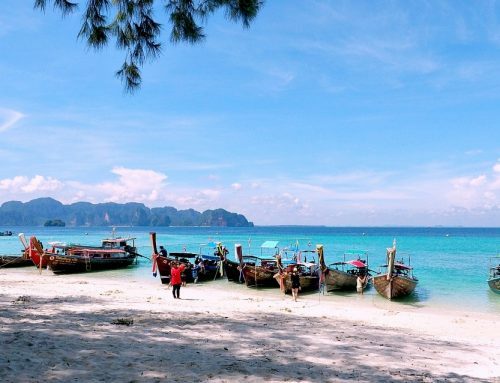 There are heaps of good quality mid-range options and budget guesthouses throughout the town. Here’s some popular Ayutthaya accommodation for you to choose from. Baan Thai House is a relaxing hideaway featuring twelve Thai-style villas. Villas have private balconies offering either garden or lake views. There’s an open-air restaurant with lovely views of the fabulous garden. And a sparkling pool to cool off in after a hot day of sightseeing. Or perhaps you’d prefer a relaxing massage in this tranquil oasis. For more information and the latest prices for Baan Thai House click here. Located at the end of a quiet little road P.U Inn is close to the main bars, restaurants, cafes and shopping. And the night market is just a five-minute walk away. The colourfully decorated rooms are spacious and comfortable, with cable T.V, fridges and a cosy seating area. 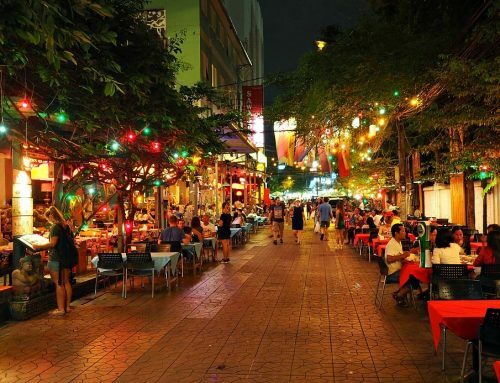 Although there are plenty of nearby eateries, there’s a convenient onsite restaurant serving both Thai and western cuisine. But the main feature of this hotel is the sparkling clear pool – it’s impossible to resist diving in. For more information and the latest prices for P.U Inn Resort click here. This Ayutthaya boutique hotel is a good value option for those on a budget. Tucked away in a quiet location this charming hotel is clean and cosy and a great place to stay in Ayutthaya. The pretty garden is perfect for relaxing with a book or new found friends. And it’s just a ten-minute walk to Wat Mahathat and Wat Rajchaburana. Bicycles are available and there’s free WiFi in all areas. For more information and the latest prices for Niwas Ayutthaya click here. The best and cheapest way to get to Ayutthaya from Bangkok is by train. Trains leave regularly from Hualamphong Station and the journey takes about two hours. We arrived in Bangkok on the night train from Ao Nang. And within fifteen minutes we were able to jump on the Bangkok to Ayutthaya train. We paid 20 baht for hard third class seats which were fine for the short journey. The Ayutthaya Bangkok train only cost 15 baht, it’s a mystery to us why it’s cheaper going this way. Trains from Ayutthaya to Bangkok depart at least every hour but it’s best to check the timetable. The Ayutthaya train station has a lovely cafe with helpful staff. We grabbed a bite to eat before hitting the streets to find somewhere to stay. So now you know why we think an Ayutthaya day trip isn’t long enough. What do you think? 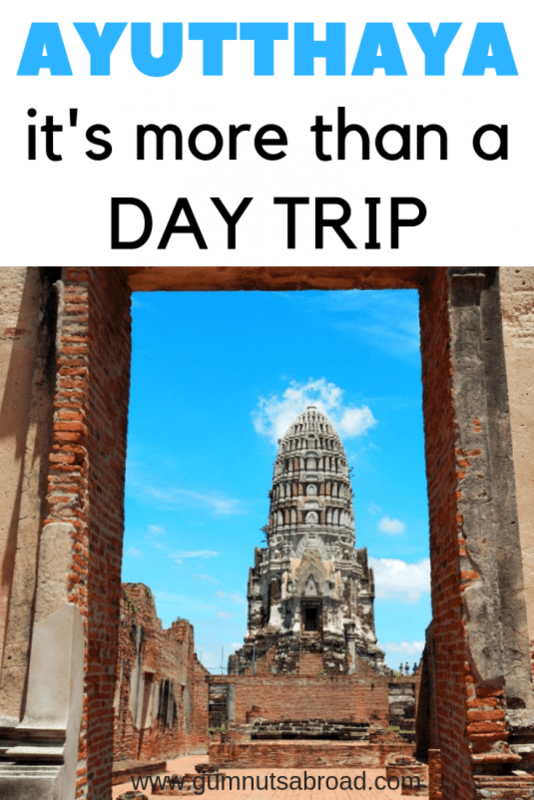 How long do you plan on staying in Ayutthaya? 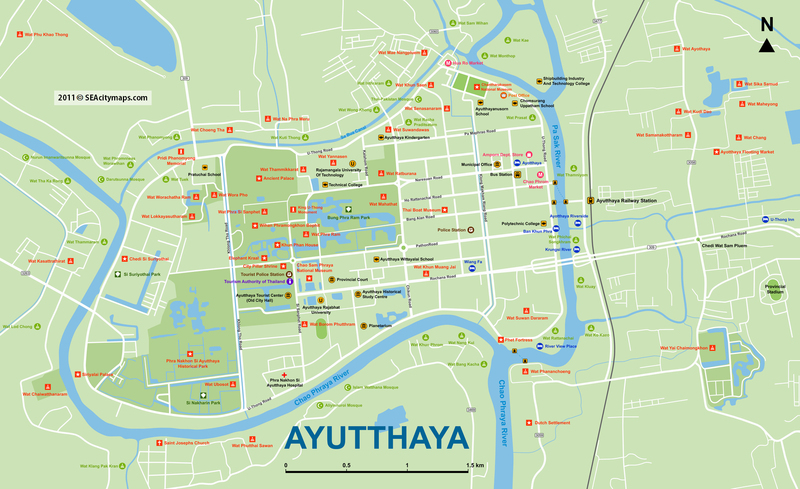 Click here to find the best places to stay in Ayutthaya. 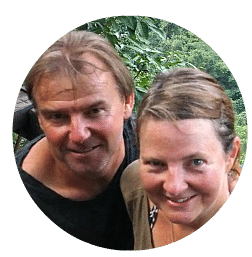 You can find more helpful articles about Thailand here. I’m sorry I don’t remember the name. We booked it through our hotel P.U. Inn Resort. Have a great time and thanks for reading.